On the hundredth anniversary of LSE economist and inventor Bill Phillips’ birth, Professor Nicholas Barr remembers the adventures and achievements of his former teacher. AWH ‘Bill’ Phillips (1914-1975) is famous as the originator of the Phillips Curve. Less well-known is his adventurous early life, extraordinary war record and unorthodox entry into an academic career. The son of a New Zealand dairy farmer, he became an electrical engineering apprentice and moved to Australia, where casual jobs included crocodile hunting and an electrician’s job at a gold mine. In 1937 he travelled to Britain on the Trans‑Siberian railway. His war record was deeply distinguished, earning an MBE for ‘coolness, steadiness and fearlessness’ under fire. Only after his death was he identified as ‘the gifted young New Zealand officer’ who built and operated the secret radio which is the central focus of Laurens van der Post’s autobiographical reflections on life in a Japanese prisoner of war camp (see below), and on which Phillips heard that a bomb had been dropped on Hiroshima. Back in Britain, he registered for a Sociology degree at LSE but, like many of his generation, became very caught up with Keynesian theory. He was particularly taken with the analogy between economic flows and hydraulic flows and set out to build a machine to illustrate the workings of a Keynesian model. 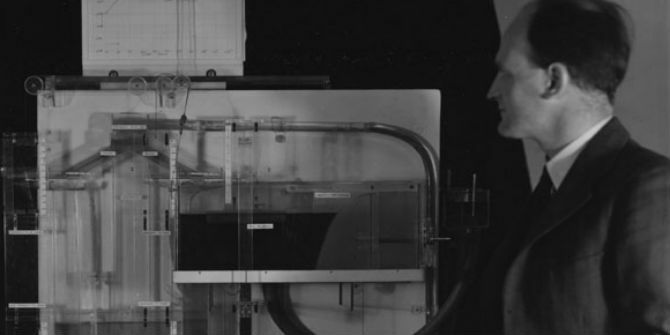 In the machine, money flows were represented by water circulating round a series of clear plastic tubes, with outflows representing savings, taxes and imports, and inflows representing investment, government spending and exports. In the end, economics took up most of his time. He graduated in 1949 with a Pass degree in Sociology. Over the following year, with encouragement from James Meade, he completed the machine and demonstrated it to Lionel Robbins’s seminar. Everyone who mattered was there. They gazed in some wonder at this large, 7 foot high ‘thing’ in the middle of the room. Phillips, chain smoking, paced back and forth explaining it in a heavy New Zealand drawl, in the process giving one of the best lectures on Keynes and Robertson that anyone in the audience had heard. The machine remained at the School, becoming increasingly dilapidated. During the later 1980s, I was involved in a project instigated by Tony Atkinson and subsequently championed by Nick Stern to restore the machine and put it on display. 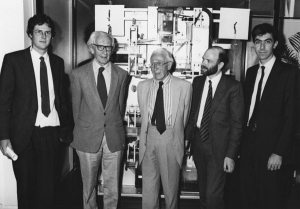 At a memorable event at LSE in 1992, the machine was brought together with a twin from Cambridge University, and James Meade gave a demonstration of the machines linked together to simulate an international economy. The restored Phillips Machine, 1989. 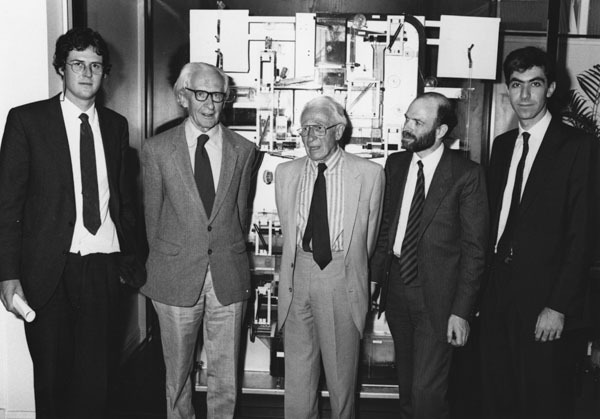 L-R: Colin Carter (a professional engineer), Professor James Meade, Professor Walter Newlyn, Dr Nicholas Barr, Reza Moghadam. Age and fragility, however, put the machine beyond the curating skills of the School, so – rightly – it is now on permanent display in the computer section of the Science Museum. Its story, in part a chapter in the history of economic thought and in part a chapter in the life of the LSE, involves some of the great names in the history of the School and the subject. Phillips rise thereafter was meteoric. He became an Assistant Lecturer in Economics in 1950, Lecturer in 1951, Reader in 1954 (the year his PhD was awarded and the year he married) and Tooke Professor in 1958. His subsequent work at LSE was broadly of two sorts. 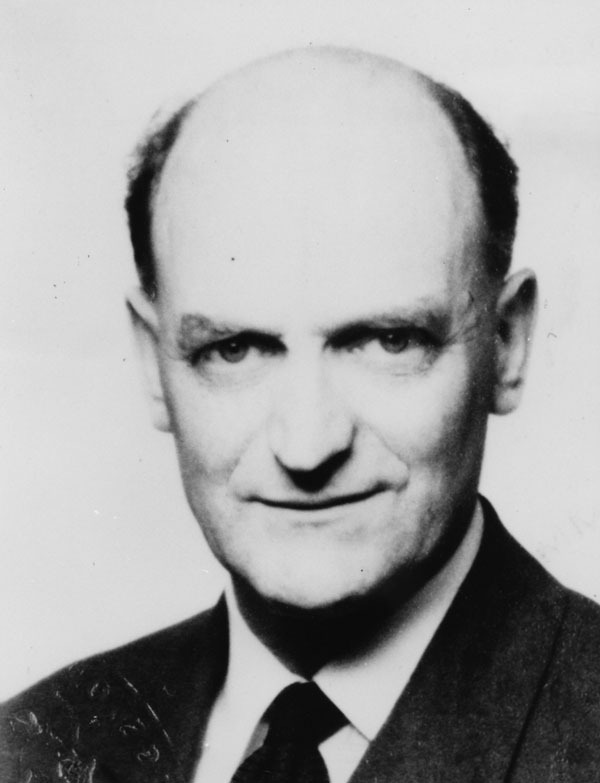 He is best‑known for his 1958 paper on what later became known as the ‘Phillips Curve’ (a name he would never have given it himself), which explored the connection between the UK unemployment rate and wage inflation over the business cycle. That work was a progenitor of important later theoretical developments, in particular the analysis of expectations in macroeconomics. The second strand was the application of dynamic control theory to economic processes, so as to strengthen the ability of the economy to return to macroeconomic stability. In 1967 he moved to the Australian National University, partly for family reasons and partly to further his increasing interest in Chinese economic development. In 1969 he suffered a major stroke and retired to Auckland, though continuing to pursue his Chinese studies. Bill Phillips made major innovative contributions to economics, rising, seemingly effortlessly, from a Pass degree in Sociology to a Chair in Economics in nine years. Despite his eminence, he remained self-effacing and approachable, even during his later years at LSE cheerfully repairing the machine. His personality was as fresh and endearing as his mind was creative. The world of economics was enriched by his restless originality; to be his colleague was to be his friend. The following text is quoted from pp. 5-6 from Robert Leeson, ‘AWH Phillips: An Extraordinary Life’, in Robert Leeson (ed. ), A W H Phillips: Collected Works in Contemporary Perspective, Cambridge University Press, 2000, pp. 3-17. The following words… are taken from Laurens van der Post’s autobiographical reflections on the three and a half years he spent in a Japanese prisoner-of-war camp, entitled The Night of the New Moon (1985). The book is organised around a secretly built and operated radio, which kept the prisoners in touch with the progress of the war, and The Night refers to 6 August 1945. We created a vast prison organisation for the re-education of ourselves … imprisonment for our men was transformed from an arid waste of time and life, into one of the most meaningful experiences they had ever known … A group of gifted and gallant young officers made a radio … we appreciated its overwhelming necessity to us … it was a near miracle … The gifted young New Zealand officer – a radio expert in civilian life – who had been responsible for reducing the set to its final minute form, and had proved himself capable of operating it for some eighteen months without any loss of nerve and with a real, if strange, enjoyment which I could not share – had impressed upon me how little he needed either to make the [malfunctioning] set operative or to build a new one … The New Zealand officer, in the dark underneath his mosquito net, began to repair, or rather reshape our radio. It was difficult, delicate and slow work, and if I remember rightly it took three nights and three dawns to give him the necessary light before the work was finished. They were among the longest days I have ever known, because everything in the atmosphere around us told us that the climax was near … only an expert like the New Zealand officer who had made the radio could take part in the listening operation … The listening officer had made three tiny coils which he slipped somewhere into his set to enable him to have a choice of three stations: if I remember rightly Delhi in India, Perth in Australia and San Francisco in America. I felt a hand tugging at my feet … It was the New Zealand officer, who lost no time in whispering to me in a tone which carried much more than just the satisfaction at the excitement of success: ‘It worked Colonel! It worked’ … He had some trouble making contact but after a great deal of fiddling had picked up a news broadcast from Delhi. Unfortunately he had not come in right at the beginning but near enough to realise that something tremendous had happened. He wasn’t quite certain what precisely it was, but in the course of the morning of the day which was now ended, something more like an act of God than of man had been inflicted on Japan at a place called Hiroshima. ‘Phillips, Alban William Housego (1914-1975)’, Oxford Dictionary of National Biography, Oxford and New York: Oxford University Press, Vol. 44, pp. 95-97, 2004. Robert Leeson (ed. ), AWH Phillips: Collected Works in Contemporary Perspective, Cambridge University Press, including a chapter by Nicholas Barr on the history of the Phillips Machine. The first half of this lecture by Tim Harford talks about Bill Phillips: http://www.youtube.com/watch?v=k7f4L1nkHPI&feature=youtu.be.